The work to create a CERIF mapping that could then be indexed via Solr and presented via SolrEyes was based on two Sample Reports, a Summary Staff Report and a Simple Publications Report, created by Dr Rosa Scoble at Brunel. The idea behind the sample reports was to identify key reporting requirements that would be useful to institutions across the sector. In doing so, we hoped to encourage other institutions to have a play with the tools produced by the BRUCE project in order to generate copies of the reports using their own data. Feedback on draft reports was sought via the Project Advisory Group. That feedback was then incorporated into the reports that are now being made available here. 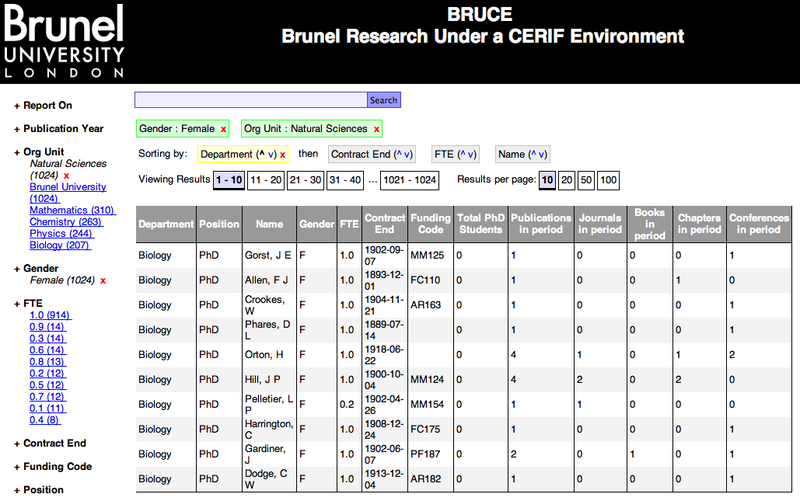 Due to the privacy and data protection status of the real research information at Brunel – which includes data such as pay scales and so forth – it is not possible for the project to demonstrate its tools to people who are not Brunel employees (at the very least). Furthermore, that data cannot even be taken off-site or placed onto computers which are not under direct control of the university. Combine this with the need within the project for two parallel development tracks: one mapping source data (such as HR and publications) into CERIF and the other indexing and reporting on that CERIF data, and there is a compelling need for a test dataset. A test CERIF dataset could be used in any demonstrations of the project outputs, and could be put in-place for the CERIF indexing side of the project so that it is not critically dependent on the outputs of the data mapping side. Initially we had hoped that such a dataset already existed, but there was nothing available on the euroCRIS website (the CERIF guardian organisation) and extensive searching turned up nothing of value. There are other JISC projects which may ultimately have yielded some useful data (such as CERIFy), but they are also running in parallel to BRUCE. The project therefore developed a piece of software which can be used to generate test data, and has made it available open source here (in the cerifdata folder at that link). We were lucky that at exactly the time that we were seeking for a seed dataset, the Open Bibliography project – also JISC funded – had succeeded in liberating the MedLine dataset consisting of around 20 million publication records. This was an ideal source of the most difficult data to artificially generate: author names and publication titles. By using this dataset as our seed we would be able to generate artificial research data based on open access bibliographic data, which would give us the freedom necessary to do as we needed with the dataset at the same time as making it look suitably realistic. Although actually done in several iterations, the model we worked towards was as presented in a previous post. This meant generating data about Staff, Organisational Units and Publications. We have only written code to generate the data required for our example model, but we have endeavoured to write the software itself in a way which allows it to be extended throughout the project and into the future. First, source data is obtained from the MedLine data file. This source data is then passed through a set of CERIF data “aspect generators” which produce CERIF entites and relationships (such as staff records and their relationships to organisational units and publications). These are then written to CSVs which reflect the database table structure in the CERIF SQL schema. The CSVs are finally converted into a single large SQL file suitable for import into a database. The architecture of the software is designed to be flexible so that new aspects can easily be added and existing aspects can easily be modified. This shows us a person with ID f0b2517b-4b65-4fa5-b562-ff931cd213f2 who is Female (from cfPers.csv) who has the name Teresa,J,Krassa (from cfPersName.csv) who has funding from funding code MM122 (from cfPers_Fund.csv), who is an Employee of Organisational Unit 1, is a PhD Student in Organisational Unit 3 and is a Member of Organisational Units 1, 2 and 3 (from cfPers_OrgUnit.csv). It also shows that this person is the Author of a Result Publication with ID 1936bdc4-aadd-4028-bb9e-b9eec2561c00 (from cfPers_ResPubl.csv). This repeats with variations on the data across the entire seed dataset, giving us a rich spread of people, publications, organisational units and relationships between them upon which to carry out our development, testing and demonstrations. These CSVs are then converted into a single SQL file, which can then be imported into our MySQL database and used. If you wish to use the software yourself, you can download it from the version control but unfortunately at time of writing the MedLine data in the format required by the program is not publicly available. It is available as n-quads on CKAN and the project is discussing with Open Bibliography the possibilities of publishing the data in its original format also. In the mean time, please feel free to contact us and we will be able to help you obtain the data in the relevant format. The Project Steering Group, chaired by Professor Geoff Rodgers the Pro Vice Chancellor (Research) at Brunel, met for the third time on Thursday 21st July. The minutes of the second meeting (Minutes_BPSG2) were agreed and, as agreed by the Group, are now being made public here. This is a very small list of useful Solr URL parameters. It’s mostly for the benefit of the project group, but you might find it useful too! The basic query parameter. In this field you can put your full Solr query. If you are using the dismax query type (see below) then you can only put freetext searches in here (like q=whatever), otherwise you can construct full Lucene queries (like q=author:richard). If you are using the dismax query type, use q.alt for full Lucene power instead. Sort field and direction. Specify a field followed by a space followed by the direction (desc/asc). You can also specify multiple sort fields, and present them here in the order that you want to sort them by; so sort=title asc,author desc and so on. Specify the query type. In particular, the dismax is very useful for freetext searches. See http://wiki.apache.org/solr/DisMaxRequestHandler for details. When using dismax the q parameters will only work for freetext searching, and q.alt should be used for full Lucene query power. Obviously the full list of URL parameters for Solr is much larger, and we’ll add to this cheat sheet the parameters which we think are the most useful as we go through the project.